What lies beneath Pluto’s icy heart? New research indicates there could be a salty “Dead Sea”-like ocean more than 100 kilometers thick. 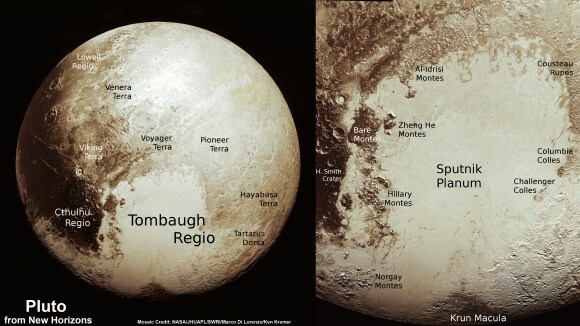 Research by Johnson and his team focused Pluto’s “heart” – a region informally called Sputnik Planum, which was photographed by the New Horizons spacecraft during its flyby of Pluto in July of 2015. New Horizons’ Principal Investigator Alan Stern called Sputnik Planum “one of the most amazing geological discoveries in 50-plus years of planetary exploration,” and previous research showed the region appears to be constantly renewed by current-day ice convection. The heart is a 900 km wide basin — bigger than Texas and Oklahoma combined — and at least the western half of it appears to have been formed by an impact, likely by an object 200 kilometers across or larger. Johnson and colleagues Timothy Bowling of the University of Chicago and Alexander Trowbridge and Andrew Freed from Purdue University modeled the impact dynamics that created a massive crater on Pluto’s surface and also looked at the dynamics between Pluto and its moon Charon. The two are tidally locked with each other, meaning they always show each other the same face as they rotate. Sputnik Planum sits directly on the tidal axis linking the two worlds. That position suggests that the basin has what’s called a positive mass anomaly — it has more mass than average for Pluto’s icy crust. As Charon’s gravity pulls on Pluto, it would pull proportionally more on areas of higher mass, which would tilt the planet until Sputnik Planum became aligned with the tidal axis. So instead of being a hole in the ground, the crater actually has been filled back in. Part of it has been filled in by the convecting nitrogen ice. While that ice layer adds some mass to the basin, it isn’t thick enough on its own to make Sputnik Planum have positive mass. The Mountainous Shoreline of Sputnik Planum on Pluto. Great blocks of Pluto’s water-ice crust appear jammed together in the informally named al-Idrisi mountains. Some mountain sides appear coated in dark material, while other sides are bright. Credit: NASA/Johns Hopkins University Applied Physics Laboratory/Southwest Research Institute. The rest of that mass, Johnson said, may be generated by a liquid lurking beneath the surface. Johnson he and other researchers will continue study the data sent back by New Horizons to get a clearer picture Pluto’s intriguing interior and possible ocean.